We’re thrilled to announce that Blue Rock Sports talent Kane Lambert has agreed to a two-year contract extension to Richmond, taking him through to the end of 2019. Midfielder Lambert, a mature-age rookie success story, has had a career-best season. 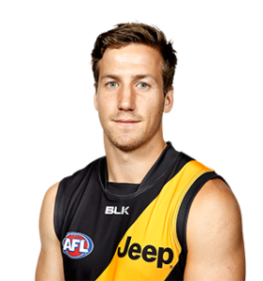 The 25 year old has played a career high of 20 games in 2017 as a valuable member of the Tigers’ midfield, averaging 21.2 disposals and 3.8 inside 50s. List manager Dan Richardson said the club was thrilled to secure players who have been critical to driving the Tigers back into the finals this year. “Kane’s story is quite remarkable. He has worked his way up the VFL ranks, to the Rookie Draft and is now playing consistent AFL football,” he said. Lambert was recruited as a mature-age rookie at the end of 2014 before being elevated to the senior list before the start of the 2015 season. He signed a one-year contract for 2017 last November and had polled the fifth most coaches votes at Richmond this season up to round 21. Lambert joins other Blue Rock Sports Talent, small forward Daniel Rioli who recently signed on until the end of 2019.